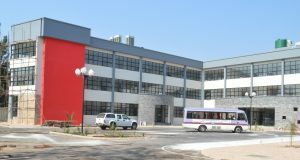 CANADA: The General Secretary of the United Church of Zambia Rev Dr Peggy Kabonde-Mulambya visited Canada between 21st July and August 2014. It was there that she was privileged to meet the Rev Dr Jim Kirkwood an early church father whose ministry in Zambia was actually two years older than the United Church Zambia , having worked two years( 1962-1964 )under the United Church of Central Africa in Rhodesia in Luapula area of Northern Presbytery then at Kafulwe. Rev Dr Kirkwood in his own words writes, “It has been such a pleasure to see you here in Canada at the meeting of the United Church of Canada’s Partner Council. Also to have my picture taken with you as the current General Secretary, guiding the UCZ into the second half of its first century! There (Zambia), I learned a lot about ministry (and politics) from Rev John Ngona. 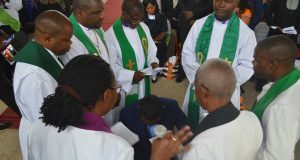 I remember the joy of the inaugural service at Mindolo that a United Church was now taking on the name of the new nation, and determining to serve it. 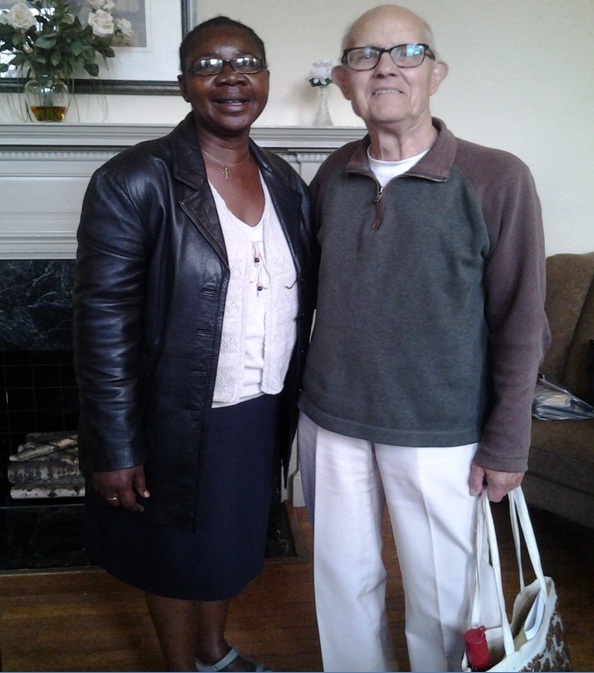 Posing in the two photos the Rev Dr Jim Kirkwood and Rev Dr Peggy M. Kabonde. I remember too that we debated fiercely in the early days whether the Church could support President Kaunda’s guiding philosophy of Humanism for the new nation. It was authored largely by our own Colin Morris, and was a secular ethic that was entirely compatible with a Christian ethic. But it did not push the name of God, as that would have been a dividing factor between us and people of other religions and no religion, and the nation desperately needed a unifying belief. My wife Marion taught in a government school at Silver Rest for 3 years, and my 4 children attended Zambian government schools for 8 years, (the first one in Chibemba).We all send our greetings and our tribute to the UCZ. It was a formative part of our lives and our faith. We send our special greetings to Christians where we served at Kafulwe/Mununga/ Kashikishi; Kalululshi/Chibuluma; and Chelston/Kalingalinga/Chalimbana (and 9 other congregations). They all very much contributed to the shape of our ministries and our lives. Lesa amupale bonse, no kutwalilila kumutungula ku ntanshi mu kukula ubufumu bwakwe. BaShi Polo, BanaPolo, Paul, Jane Joy and Kenneth. 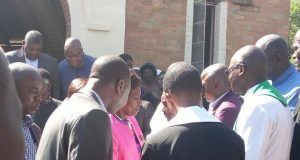 Previous: Zambians called to Celebrate 50 Years of neither Jew nor Greek, Slave nor Free, Male nor Female, but all one in Christ Jesus.